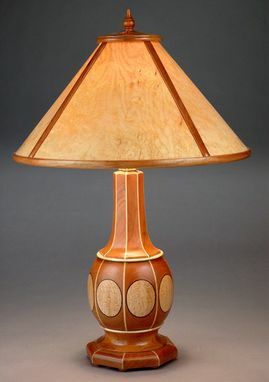 The lamp base features a segment turned body of black cherry with maple burl and wenge accents turned in a bead shape. Eight maple burl and wenge onlays become medallions when turned. 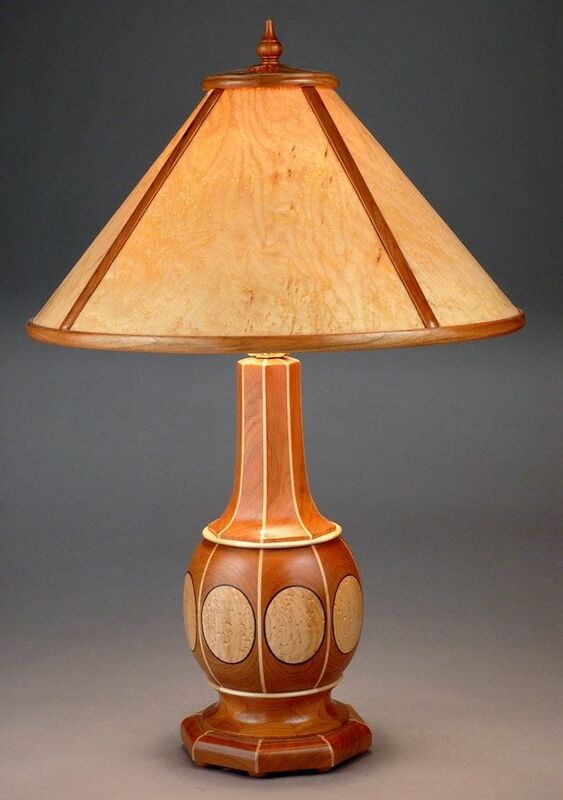 A turned waist leads to an octagonal base on 8 turned feet, all in cherry. The neck is also a segment turned section, which is then carved to undulating flattened sides. The lamp is fitted with a either a 2 bulb cluster that can hold up to 100 watt compact fluorescent bulbs, or a 3 way socket that holds a 3-way compact fluorescent bulb with the light equivalence of 150 watts for reading or tasks, or as little as 50 watts for accent lighting. The bulbs are included. Dimensions: 26" to top of shade. Shade is 17" across by 10" high. The base is approx. 6" across.